Scalise Wins Majority Whip in Congress! Victory in the Supreme Court! The last few days have been full of successes at the Supreme Court. We have much to be thankful for with these victories, but we should remain vigilant, understanding that true protections come through legislative action, not court decisions. See below for more analysis. Also, read my thoughts in the main article on Senator Landrieu's response to the passage of HB 388 in the Louisiana Legislature. I could not believe that she inferred that the legislation was a "shame"! Finally, find out about the Planned Parenthood mailer I received in MY mailbox on June 27th! P:S: Don't forget to register for the Joshua Leadership Institute! Register TODAY for the Joshua Leadership Institute (JLI) 2014! It will be held in Baton Rouge from July 27th-31st. JLI is open to high school and college pro-lifers. If you want to learn how you can become a pro-life leader, please join us! LA Rep. Scalise Wins Majority Whip in Congress! 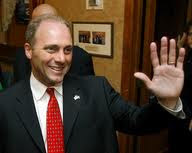 Louisiana Right to Life (LARTL) is thrilled that our own Louisiana representative, Steve Scalise, won the race for Majority Whip in U.S. Congress. Scalise represents Louisiana's First Congressional District and he will be instrumental in moving the pro-life cause forward in Congress! He has a 100 percent pro-life voting record with National Right to Life and has worked closely with LARTL in the past! Victory in the U.S. Supreme Court! On June 26th, in an unanimous decision, the Supreme Court struck down the Massachusetts "Buffer Zone" law. If upheld, this law would have prohibited peaceful pro-lifers from coming within 35 feet on women entering an abortion facility. However, the high court decided that it is our right to educate the public about abortion in the public square and on public sidewalks. In January, Louisiana Right to Life's Assistant Director, Ryan Verret, attended the oral arguments presented in the case. Read more about his experience by clicking this link! was ruled on June 30th. The Supreme Court resolved in a 5-4 decision that Hobby Lobby, a Christian-run store, doesn't have to pay for abortifacient drugs in their employee health care plans. While the Hobby Lobby decision was certainly a victory, it should be noted the narrow scope of the decision. Many anti-life aspects of "Obamacare" remain and must be fixed by legislative action in Congress. Check out National Right to Life's review for more detail. Please consider making a contribution to Louisiana Right to Life. With your generosity, we can continue our lifesaving work throughout the state, and stand as a leader throughout the nation. physicians to have admitting privileges at a local hospital. Unfortunately, in a Politico article on the same day Gov. Jindal signed HB388, Sen. Mary Landrieu crushed any bipartisan unity by unfairly criticizing Jindal. She claimed that one of the only reasons he has signed this bill into law is because of his interests in the 2016 presidential election. Landrieu accuses Jindal of not "serving the people of Louisiana." It is disappointing that Senator Landrieu would attempt to politicize what has been an overwhelmingly bipartisan effort. Democratic Rep. Katrina Jackson authored HB388, and 66% of Democrats in the Louisiana Legislature voted for the legislation. The bipartisan mandate to protect Louisiana women exhibited by the passage of HB388 shows again that Louisiana is a pro-life state. clearly for the first time that she opposes federal legislation to protect unborn babies at 20 weeks fetal age that can feel pain. Senator Landrieu said, "Some of the bills being passed around the country are just very intrusive to personal decisions and very harmful to women and girls, you know, to their physical health and life. It's a shame," Landrieu said. "20 weeks is not the norm for being able to live outside of a hospital." For over a year now, we have been working to get Senator Landrieu to support this legislation known as the Pain-Capable Unborn Child Protection Act. It is disappointing to see our Senior Senator oppose such a modest proposal to protect babies that feel pain. just before she showed her opposition. In the article, Senator Landrieu stated that she believes "life begins at conception." How can you believe that a life begins at conception but OPPOSE legislation that would protect that same life 20 weeks later? This position does not make sense. Either you believe life is valuable, and therefore you protect it, or you do not. You cannot have it both ways! We also ask Senator Landrieu to reconsider her opposition to legislation that protects babies that feel pain. For this legislation to succeed in Congress, we need Senator Landrieu to represent Louisiana and be a voice for those who cannot speak for themselves. On June 27th, Louisiana Right to Life's Executive Director, Benjamin Clapper, received a mailer from Planned Parenthood, complete with photos of happy people and positive taglines, encouraging him to rely on Planned Parenthood to provide needed healthcare in New Orleans. Clearly, it went out to thousands of people across the region. While they are trying to build a new regional abortion facility on Claiborne Avenue, Planned Parenthood is busy using expensive advertisements like this to convince the people of New Orleans that they should be trusted. Of course, none of their advertisements mention abortion. Would you please sponsor at least one $100 radio spot? Your donation will go directly to putting at least one more spot on the air to inform thousands of people about the truth of Planned Parenthood. Be sure to write "sponsor a spot" in the comments section of Louisiana Right to Life's donation form. Louisiana Right to Life, established in 1970, works through education, legislation, activism, and service to restore the right to life in Louisiana by opposing abortion, euthanasia, and other life destroying actions.